Ron Morelli’s L.I.E.S. (Long Island Electrical Systems) is like a techno factory. It’s easy to picture powerful pistons and sparking conveyor belts producing these roughly hewn beats. Across 2 discs — one of collected singles and another of new material — 19 producers from the L.I.E.S. family bend and warp techno, disco and every hue of house music, then pack it in styrofoam and cotton before shipping it off. L.I.E.S. has been called “Workingman’s Techno”, due to the no-nonsense approach to their productions, as well as their relentless release schedule. They have put out over 30 releases in 2013, and compilations like Music For Shut Ins are essential, providing a snapshot of not only where L.I.E.S. stands, but it also gives an interesting insight into electronic music as a whole. Being passionate about culture in 2014, whether making or producing, can be overwhelming. Digital musicians are buried in possibilities, with even the most basic machines offering infinite multitracking. It can be tempting to fill every beat, every inch of the stereo field with sonic bric-à-brac, and get lost in obsessive detail and perfectionism. It can be bad for productivity, as well as songwriting. The producers on Music For Shut Ins, like a lot of current underground labels, circumvent this by getting back to a basic love of hardware and machines, getting back to the basics of jamming on electronic instruments, with the results often recorded straight to tape. This is the sound of synths and arpeggiators and dusty drum machines, returning to the roots of Detroit Techno or Acid House. The main unifying thread across Music For Shut-Ins, and all of L.I.E.S.’s output, is the image of a human hunkered down over a machine. You can sense the hands and fingers of the producer’s in the modulated plastic funk as basslines and beats are skewed, dragged, chopped, and made to dance. They remind us of the inherent hypnosis of infinitely repeating parts; it’s like watching the gears of some gigantic clock. Music For Shut Ins is mainly intended for those devoted to electronic sounds, in whatever form they come in. You won’t find much in the way of traditional pop songwriting here; there is no call and response, no return to form. Instead, the often lengthy productions stream along like some futuristic automobile, with noisy synthesizers and syncopated high hats rising and falling, building and breaking. This is truly machine music – a reflection of the mechanical world we live in, and an attempt to transmogrify it into art. For me, the most exciting thing about Music For Shut Ins is the reminder of the psychedelic nature of electronic music: the colorful scenery it plants in your imagination, which don’t necessarily have a basis in concrete reality, and the hypnotic power of repetition, which draws an often forgotten connection between dance music and the arty, avant-garde classical movements of the 20th century, that placed emphasis on machine processes and repeating, interlocking parts. Yes, that’s right, L.I.E.S. is like Schoenberg and Steve Reich collaborating with Kraftwerk in the Boiler Room. Music For Shut Ins is intended as “club music for people who hate going to the club”, and there is a sense of introspection and experimentation on these discs. These tracks deserve to be in a club, however, and would go over gangbusters in moving a crowd. Due to the rising popularity and credibility of L.I.E.S., this infestation is probably inevitable. I relish the thought of black-clad youth twisting and gyrating to this warped machine funk. Clocking in at over 2 1/2 hours, Music For Shut Ins is a lot to take in, in one sitting, although I recommend doing so, as it will take you places. For those looking to sample, some standout tracks are the ruined techno onslaught of Vapauteen’s Basilisk (the album opener, and my personal favorite), or the swarming, stomping “High Heel Sleaze”, by Svengalisghost, which sounds like alien microbes growing in a petri dish. Marcos Cabral’s “Dancing On Manhattan” is a slick, if slight, take on Eurohouse, while Daywalker & CF (a collaboration between Willie Burnett and Jon Beall) has the fuzziest and warmest outing here, with “You Only Live Once”, which might be the most accessible for the casual listener. If you have even a passing interest in electronic music, or the status of modern culture, you MUST listen to L.I.E.S. They are a guiding light through the digital void, guiding us back to reality, towards bedrooms and warehouse parties. Real music made by real people. 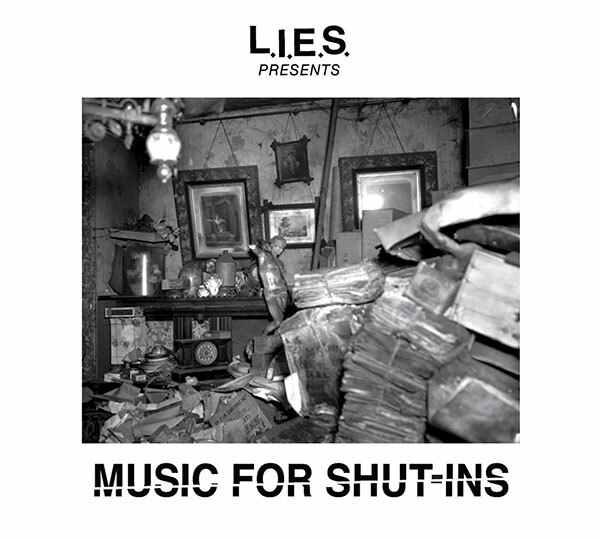 Music For Shut Ins is the second year-end compilation L.I.E.S. has released in what will hopefully become a tradition, and they show us they have treasure troves of ideas. Take this opportunity and see where the noisy underground is at. Like the Roman god Janus, L.I.E.S. is both looking forward and backward, simultaneously.